Hello! I am trying to troubleshoot my Roth Dual Oil tank setup and why they are not equalized. In the 5 years I have lived in the house, they have always been exactly equal or tiny tiny differences - so I'm sure whatever is going on is not a design or installation issue - it is a failure of something somewhere. Tank A currently reads 3/4 full. Tank B is at or slightly below 1/8 full. When I went down to check the oil I was expecting both to read somewhere around 1/2 full. Knowing how low tank B is and how full tank A is, this has been going on for quite a long time (it's been warm weather and no heat used other than hot water up until a month ago). I suspect the problem happened about a month after my last fill. 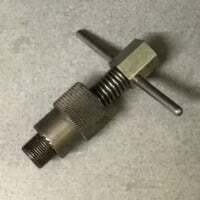 First question (see attached picture): What is this valve called? It is very clear that it has an inlet for fuel that is drawn from the other tank, as well as drawing fuel from the tank it is located on top of. It has a single outlet for fuel that goes to the furnace, and a return inlet (outlet?) that is unused. The lever on the top is in the up position currently. I believe it should be in the down position, and might actually be the root of my entire issue. If I am correct that it should be in the down position, what could cause it to move to the up position without any outside disturbance? Second question: Is it safe to have my tanks filled, and will they be equalized after the fill? Third question: if the answer to the first question does not provide my fix, what should I be looking at as the issue? What is the order of steps in troubleshooting? First, the lever must be up. Tank A has a clogged, or broken pick up line and is not drawing fuel. That tank valve and float type pick up tubes were abandoned by Roth some years ago. 1/2" L copper pick up tubes. 1/2" copper coated oil line out of each tank with inline ball valves so you can isolate each tank, and clear each line individually if needed. Tee them together, and continue 1/2" oil line to the equipment. Most recommended putting an oil filter at the tank(s). DO NOT HAVE AN OIL COMPANY FILL THOSE TANKS!! Sorry for the caps, but if they try to fill you will spill oil. They won't equalize on their own and you will have a disaster. Never use the manifold fill, for the very reason you encountered. You can Tee the vents together, each with their own whistle, but 2 fill lines, one per tank. I'm pretty adamant about this, regardless of what any manufacturer will argue. They will never always draw down equally, so they will never be at the same level. And therefore, re-filling them risks a catastrophe, which by your diligence you will now hopefully avoid. If I were there, I would re-pipe the 2 fills, then each tank is filled separately until the whistle tells you to stop. If you don't want to do that, someone is going to have to equalize the volume of those tanks. The tanks will equalize when pulled into a vacuum. When I worked at an oil company they had (2) 20,000 gallon tanks buried in the ground. They had a 4" common suction line coming from the tanks to a large pump which went to an overhead pipe rack to fill truck with. The tanks were in the ground so it was suction lift. 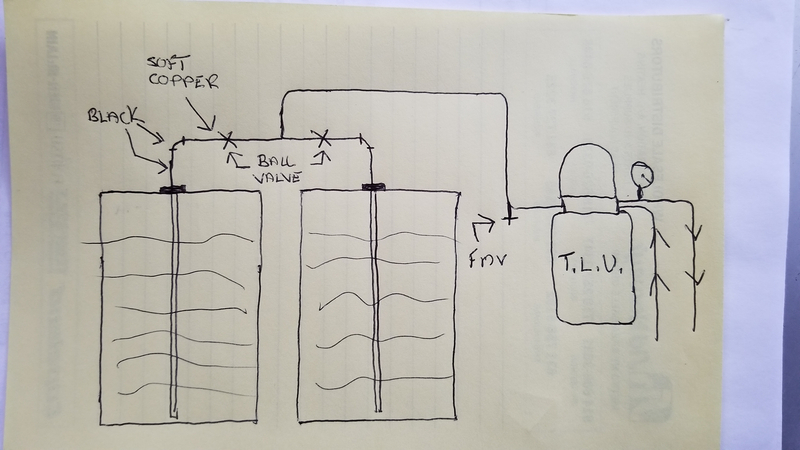 I always figured the tanks were connected across the bottom underground (which is illegal) but I was told with a vacuum on the suction line they would equalize, just like a syphon. I don't believe the problem in this case is the fill and vent and equalizing. The pick up line on tank A is broken. Unscrew the top and shine a flashlight in there. The plastic tube will be floating there like a dead eel. Or the valve is closed on tank A. Are you guys saying with one tank at 3/4 and the other below an 1/8th, that filling these tanks won't cause a spill? I'll take any bet, for any amount. Save some of your money for the cleanup. I agree the immediate problem is the something in the pickup, but no way should the H/O get a delivery until those tanks are equalized. Being that there is going to be some work done on the tank system anyways, I'd change to 2 fill pipes, no equalizer, and pipe the pickups with copper, following manufacturer's directions. I dont know @STEVEusaPA. Your probably right but with a Roth, I'm in for a cool $1.00. I dont know from experience, just what I see in the field. I've never installed twin Roths so I dont know the innards of the (dual) fill. Even on steel tanks your saying (or not) dont- fill on one tank, 2" crossover, and vent the other? This is how I've repiped the oil line(s) after removing the Roth float type. 1/2" L pick up, no soft copper sleeves through. 1/2" gal. out the top of the bushing. 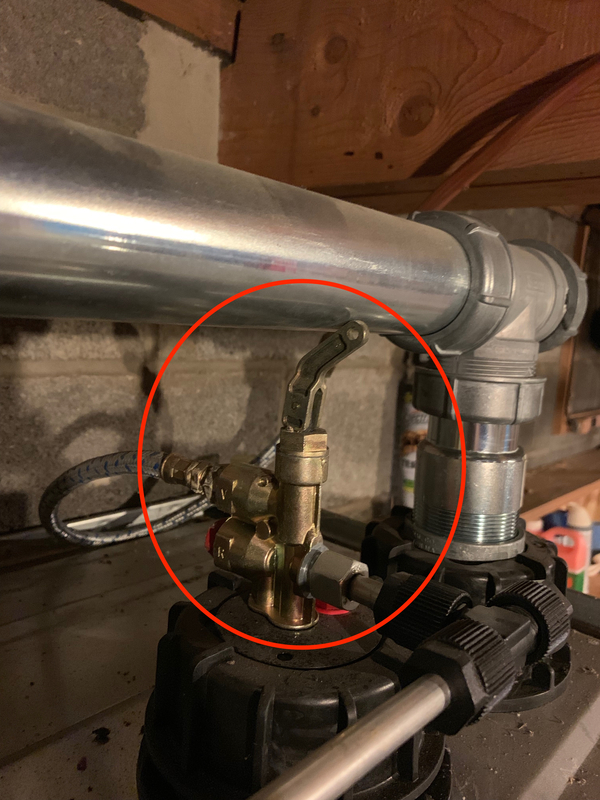 Go to 1/2" coated oil line with a flare ball valve so you can isolate between the tanks, and valve off the oil in the suction line. The 1/2" L pick up can be also be easily removed. Break a flare, unscrew the bushing and pull it out. On the ground or up, over, and down, I sleeve the suction line through 3/4 seal tight conduit. with the either copper tubing or black iron pipe. compression fittings are then tightened. addition to the one supplied with the tank. keeping the same quantity of oil in all the tanks. from one tank to the other until all are at the same level. resemble a pyramid in design. I don't understand your post. Are you shocked/amazed that you found the manual? ''manufacturers directions" state you can pipe it individually or with the manifold. I'll never use the manifold for fills, and to avoid problems with too many proprietary plastic parts, I pipe the lines to the burner in copper. The Equal Manifold stays at the Roth factory. Copper to an evenly spaced tee with isolation valves. I think I misspoke or in this case miswrote. This is what I was getting at. 2 suctions lines one from each tank teed together with the common line going to the burner. Once the system is primed and air free the burner will pull a vacuum on the 2 oil lines. If the oil level in one tank is higher than the other the burner will pull from the higher level (path of least resistance) When the burner shuts down oil will also syphon from the higher tank to the lower tank until equalized. Just like syphoning a gas tank. 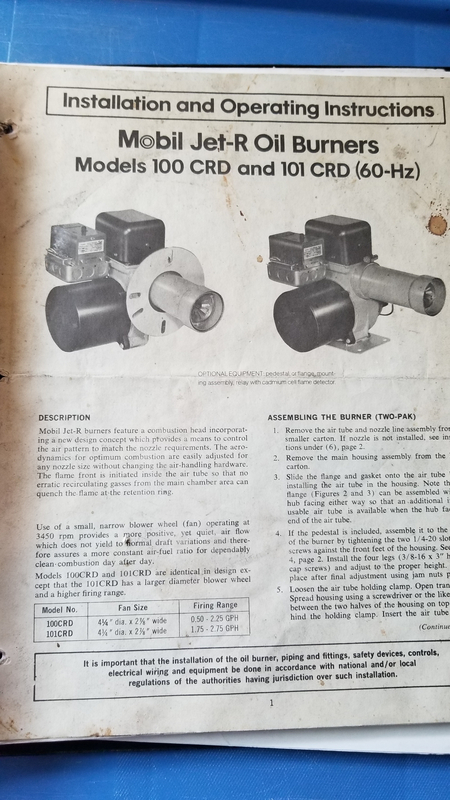 I was being sarcastic, I have yet to see hardly anyone go to the manual, refer a DIY to the manual, most problems are solved there, time is saved there, time is money, when you encounter a problem go to the factory manuals, they built the stuff, they engineered it, they wrote the troubleshooting procedures, in some cases a technician may have found an answer and say "the factory said this, but this works better, or the factory rep came out and said these changes were made" all of this flying by the seat of the pants and opinions doesn't seem logical, eh? Which "flying by the seat of the pants and opinions" are you referring to? @GBart...huh? Don't lump me in with your political nonsense. The OP wanted to know why his tanks weren't equalized, what he should do to fix it, and should he fill the tanks. I think between my first answer and @Hvacnut 's first answer it's pretty much covered. Maybe we can ask to change the name of the website to 'dontAskUsReadTheManual.com? Then no one has to give an opinion...just 'facts'. By the way, I'm not doubting the install isn't correct, according to the manual. I just don't install it that way for the reasons I stated early, and the possible situation that is occurring with the OP. Let's get back on topic. Thank you. Yes @GBart you are 100% correct. The manuals were printed for a reason. I still have some like the one below, a crate of tech manuals between the seats of my service van, and my phone weighs a s*!t ton from all the pdf downloads. This thread in particular is geared specifically as a viable alternative to the manual. Most of it due to Roth. I'm not real familiar with the fill on twinned or multiple Roth tanks. I'm guessing its like a monoflo tee. I'd rather see separate fills and vents if it were mine. The pickup tubes and the diabolical valve were quickly abandoned in the field due to the float type pickup plastic tubing always broke or the valve wouldn't open. It depends on the driver whether or not a spill occurs here. If the driver is experienced and on his game, there would be no spill because he would be listening for two whistles (one on each tank) and when the first whistle stops, he would stop filling. If the vent alarm in the tank 3/4 full is not working and it was not known that this is a twin Roth setup, it would be harder but a conscientious driver would probably hear a gurgling noise and wonder what was up. By the way, I would advocate for separate fills for Roth tanks. The picture shows a vent manifold. I know this because the tee is two inches on all sides. If it were a fill manifold, the bull would be smaller. I believe 1/2" id. These cannot be filled slowly; they must be pressure filled at or above 40 gallons per minute or the first tank would get more oil. I've seen delivery instructions that state to fill these slowly; I ignore them per manufacturers instructions. There used to be stickers that were supposed to be placed at the fill box for these but I haven't seen one in a while.